Basically Joy: S’mores Cheeseball - Chocolate, Marshmallows, & Ooey Gooey Goodness! S’mores Cheeseball - Chocolate, Marshmallows, & Ooey Gooey Goodness! This year has flown by – 2017 is right around the corner! We had a Halloween Potluck at work this past week and I wanted to make something unique. Seeing how we are in Texas and it is still in the 80s on a daily basis, I wanted to make a cold take on a typically delicious hot treat! So I give you the amazing S’mores Cheeseball! I found several different cheeseball recipes on good ole Pinterest and tweaked a sweet one that I liked to give me the following treat! As a typical girl, I LOVE me some chocolate! I also love a classic work potluck, so I organized one with my coworkers. (Another one is planned for December!) I waited until a few days before our potluck to decide what I wanted to make. If there were too many sweets, I would make a savory item and vice versa. We ended up having a pretty even split so I went with my gut (as I am more of a baker than a cook) and planned to make a sweet tooth treat. As always, I scrolled through Pinterest looking for a recipe and kept stumbling upon cheeseballs – savory & sweet recipes. I pinned several since the holidays are coming up and who doesn’t need 4000 recipes on their Pinterest that they will probably never make! I went back through and decided to go with a yummy sounding s’mores recipe and changed it up a bit to my liking! Very first thing you should know – this needs to chill for 1-2 hours before finishing the last step!! This takes all of 10-15 minutes to prepare not including that chilling time, so don’t wait until the last minute to try to whip this up! 1. 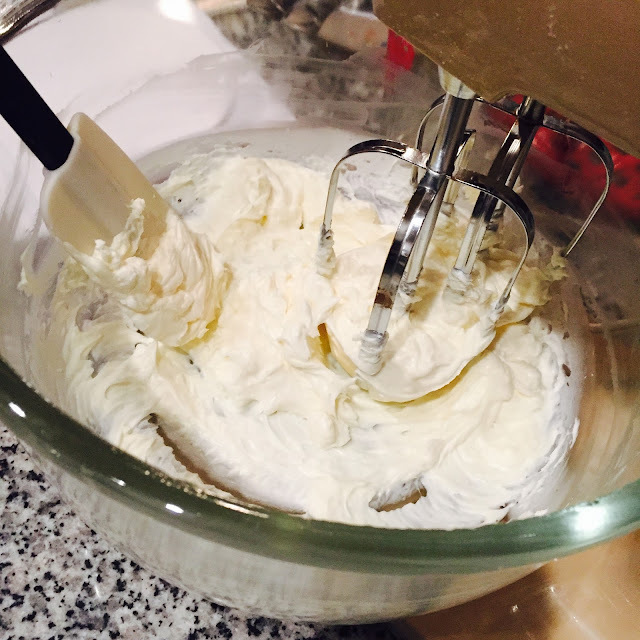 Mix cream cheese (room temperature) and marshmallow crème in the mixer until smooth. 2. 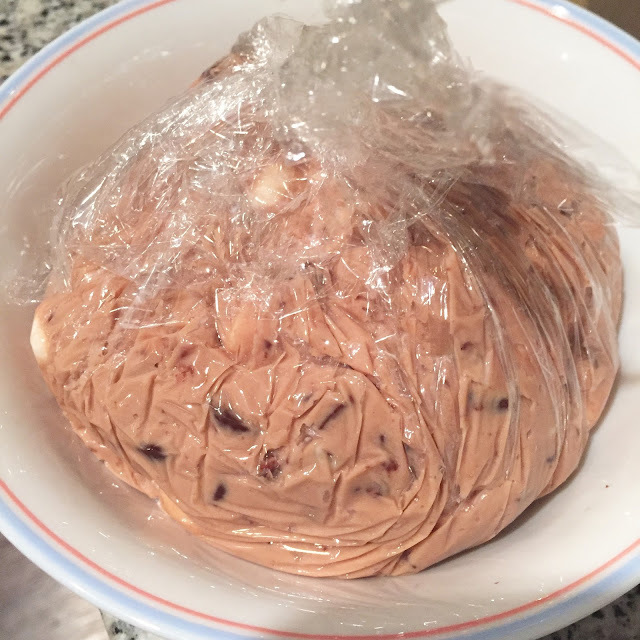 Melt 2 oz of the chocolate chips. Making sure to not burn the chocolate – do short time frames in the microwave – I start with 1 min then stir and do 30 sec intervals as needed, stirring in between intervals. Blend into cream cheese/marshmallow mixture. 3. Add the salt, powdered sugar, and vanilla into mixture until blended. 4. 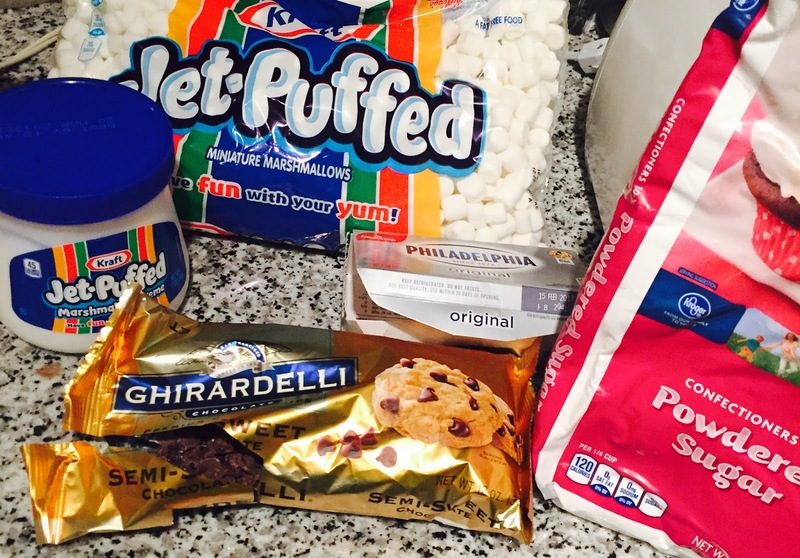 Add ½ cup of mini marshmallows & ½ cup of the chocolate chips, stir until evenly distributed through mixture. 6. Let this cool for about 2 hours in the fridge. 7. Prior to getting the mixture from the fridge, lay out a sheet of wax paper. Mix the remaining chocolate chips & marshmallows with 2 smashed full size graham crackers (the large rectangle – before they are broken apart) & spread out on the wax paper. 8. Pull the chilled mixture from the fridge and remove the plastic. Roll the mixture over the wax paper spread, coating the outside of the mixture in graham cracker, chocolate chips, and marshmallows! 9. Serve with graham crackers for dipping and enJOY!! Best enjoyed 20 minutes after removal from the fridge! Be sure to refrigerate any leftovers! I chose not to do the graham crackers on the outside this particular time and it was still fabulous! I had 2 mini scoops leftover which were quickly devoured by my other half upon arriving home! This was such a huge hit that it was requested for the baby shower I am hosting in a couple weeks! I will be doing a variation on this recipe for the baby shower so stay tuned for that in the coming weeks!! **If you made this and enjoyed or even if you had trouble with something, please let me know!! I love baking and definitely want my recipes to be attainable! So yummy! Thanks for sharing this recipe.